THE HIDDEN CITY is an incredible visual experience of the highest order. 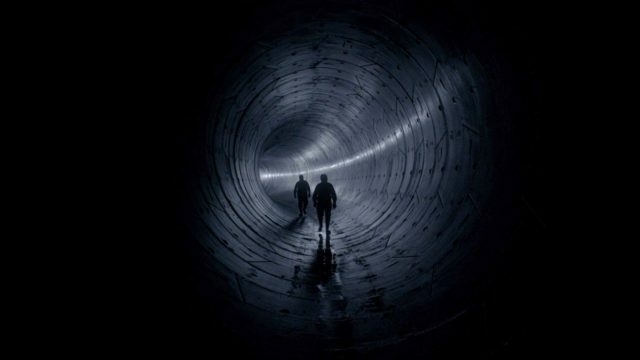 A glorious dance of light and dark this portrait of the tunnels that exist under Madrid will knock you off your feet and make you gasp. It’s not so much what it shows us (people working and living under ground) but how it shows us. For example we are not just watching sparks flying in a work site but instead some sort of orange fireworks exploding in unexpected directions. Men in environmental suits checking tunnel walls become tiny specks drifting in inky blackness. We frequently ask ourselves Are we on earth or in space? It sounds like a profoundly stupid question but director Victor Moreno has created a work that transcends time and place. Where are we? When are we? We aren’t sure. Images seem to have been pulled out of some great lost science fiction epic – except that this is all real. When I was sent a screening link for TH HIDDEN CITY and it came with strict instructions, I was to watch the film in total darkness with either really good headphones or a high quality speaker system. When I sat down to watch the film the first thing I saw was on screen instructions that said exactly the same thing. I thought it might be a little bit over kill—and then the film started and I realized that this really should be seen in a darkened theater on a huge screen where we can’t look away and can’t get distracted. I really can’t critique this film other than say it is an awesome experience. If you can see it on a big screen you should.